Your turkey will be done when the thermometer reaches 160°F in the white meat. Begin checking one hour before the end of the recommended roasting time to check readiness. We recommend that the stuffing/dressing be cook on the side. This makes cooking a juicy bird easier to monitor. Make sure when you insert the thermometer that it goes into the meat and not the cavity of the bird. 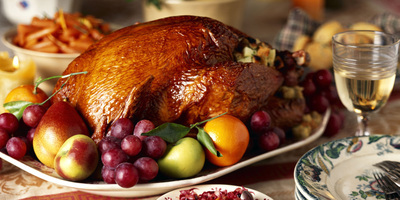 Allow the turkey to rest for 1 hour and come to room temperature before cooking. Pre-heat the oven at 450°F. Cook for ½ hour at 450°F and reduce heat to 350°F and continue cooking. Using a pastry brush, baste the bird with the wine and butter mixture every half-hour. Frequent basting will help ensure a moist bird. If the turkey drippings begin to fill the pan, remove them and save for the gravy. With 45 minutes of cooking time remaining, 60 minutes for birds 16 lbs and larger, remove the cheesecloth and foil, baste the bird and return it to the oven. This will allow the bird to brown. Save the pan juices for the gravy. Make some turkey stock using the giblets, carrots celery, onions, herbs and seasoning or buy some chicken stock. In a saucepan, heat turkey pan drippings and to thicken the gravy, whisk in flour (you can use a mixture of corn starch with a little water) until well blended. Whisk thoroughly to avoid lumps; let cook until light brown. Whisk in stock and simmer, mixing continuously for at least 15 minutes. All ovens and thermometers are not always created equal, we can’t be held responsible!